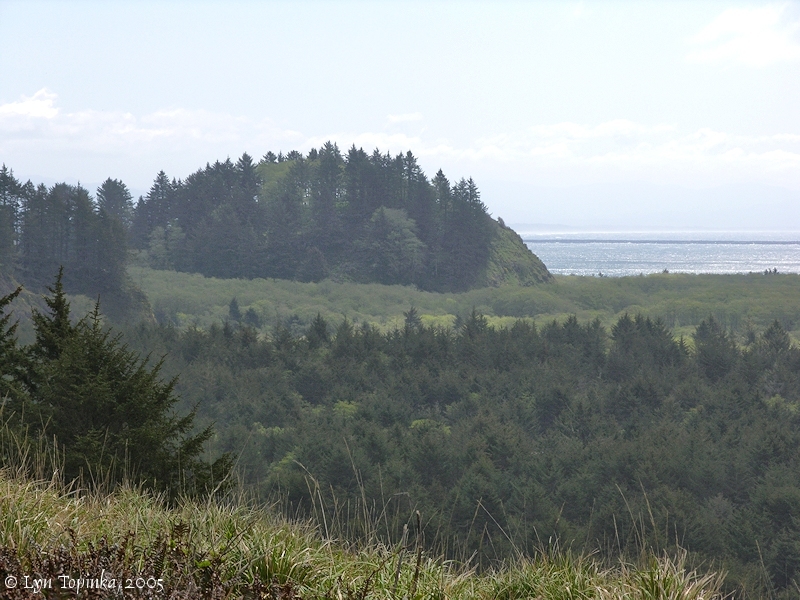 "McKenzie Head, Cape Disappointment, Washington"
Click image to enlarge McKenzie Head from North Jetty. 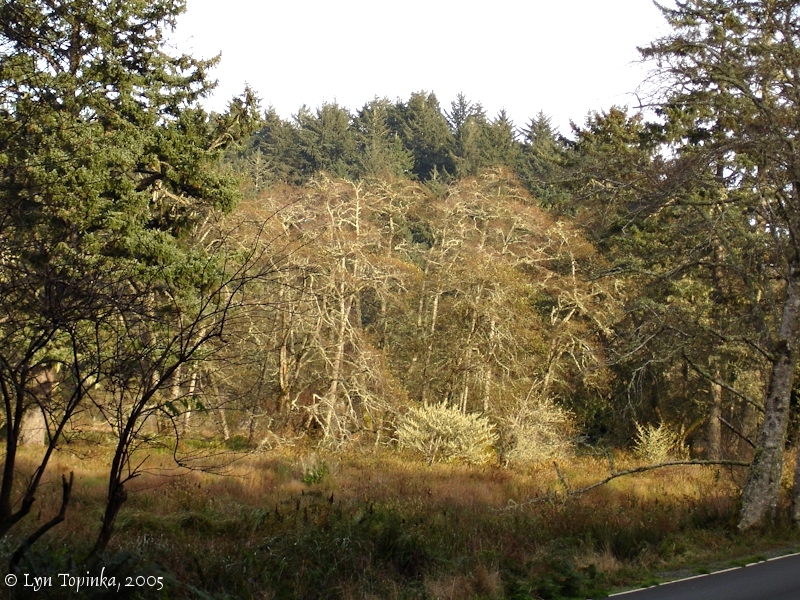 View from road following North Jetty, Cape Disappointment State Park. Image taken April 19, 2005. McKenzie Head is a rounded hill or knob which borders the Pacific Ocean between Cape Disappointment and North Head, with the North Jetty, Waikiki Beach, Benson Beach, and Deadmans Hollow being nearby. Captain Clark camped on the north side of McKenzie Head on November 18, 1805. 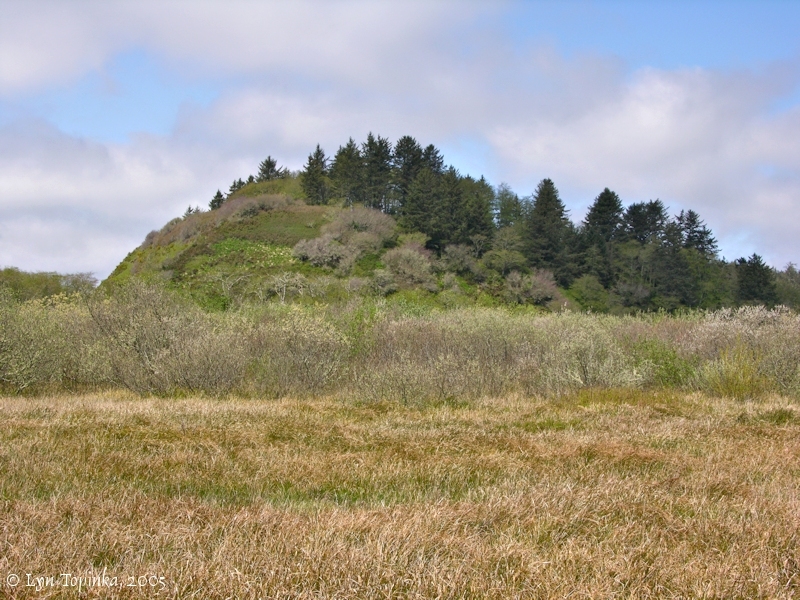 While Captain Lewis was on his way to the Pacific, Captain Clark and the rest of the men packed up their gear and left their Megler camp on November 15, 1805, and setup camp at what would be known as "Station Camp". Captain Lewis arrived at Station Camp on November 17th. On November 18, 1805, Captain Clark and eleven men left Station Camp for their turn to view the Pacific Ocean. They reached the Pacific at McKenzie Head, where they setup their camp. According to Moulton [vol.6], their camp was near McKenzie Head in the vicinity of the Fishing Rocks archaeological site, where archaeological work encountered evidence that Chinook Indians used the site as a hunting and fishing camp beginning around 1,000 years ago and continuing into early historic time. The campsite appears on the route map [Moulton, vol.1, map#91], to the right of McKenzie Head. The next day, November 19, 1805, Captain Clark journeyed ten miles up the Long Beach Peninsula, carved his name in a tree in the vicinity of today's Long Beach, and returned. His campsite of November 19, 1805 was at Wallacut River. The U.S. Board of Geographic Names made "McKenzie Head" official in 1891. Variant names were "McKensie Head" and "McKenzies Head". 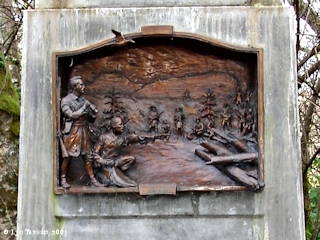 McKenzie Head was named in the fur trading days for Donald McKenzie, one of the many partners of the Pacific Fur Company who established Astoria, Oregon. McKenzie, along with William Price Hunt, were part of an overland party which left St. Louis in March 1811 and reached Astoria a year later. "... McKenzie's Head is the first knob to the northwest, three-quarters of a mile from the Light-house. It is an almost round knob, three hundred and fifty yards in extent and one hundred and ninety feet above the sea, covered with grass and fern on top and has no trees. It is almost surrounded by the sea except for a short distance on the northeast where it is connected with the Cape by a low, sandy neck covered with bushes. Towards the Light-house and towards the northwest are two low, broad sand beaches, upon which we have landed through the surf in a canoe. ..."
Click image to enlarge McKenzie Head as seen from park road, Cape Disappointment, Washington. Image taken November 9, 2005. 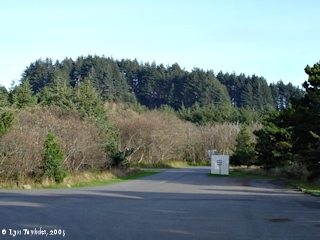 Click image to enlarge McKenzie Head as seen from campground road, Cape Disappointment, Washington. Image taken November 9, 2005. Battery 247 at Fort Canby, located on the top of McKenzie Head, was one of three Batteries surrounding the mouth of the Columbia River. Battery 245 was located at Fort Stevens, Oregon, and Battery 246 was located at Fort Columbia, located at Chinook Point, Washington. On March 12, 2004, a bronze monument was dedicated to the Lewis and Clark expedition near the location of Captain Clark's campsite of November 18, 1805. 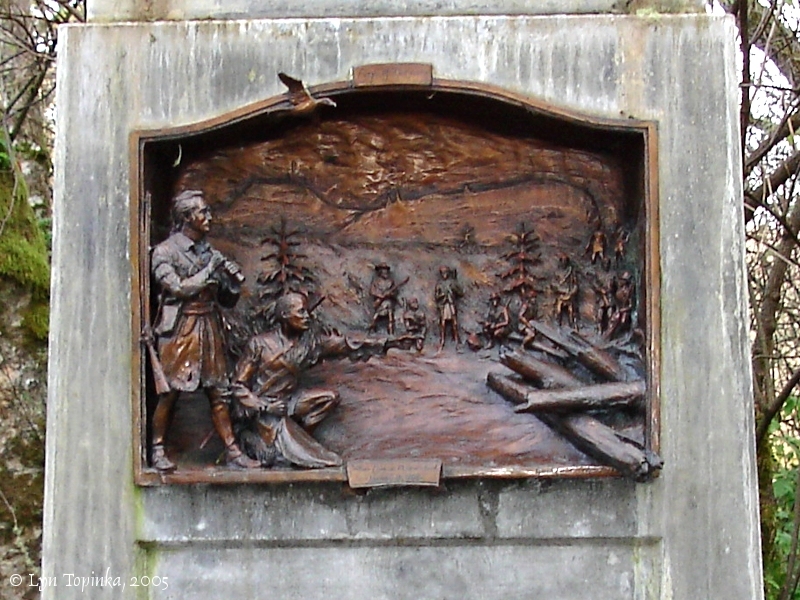 The bas-relief sculpture was commissioned by the Pacific County Friends of Lewis and Clark, and done by Olympia sculptor Gareth Curtiss. The artwork depicts Captain Clark and a group of the men who, along with Captain Clark, explored the shores of the Pacific Ocean on November 18 and 19, 1805. They camped on the north side of McKenzie Head and then journeyed as far north as Long Beach, Washington. 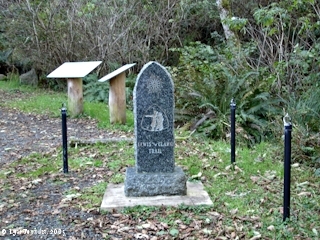 The location of the monument is at the base of the 1/2-mile summit trail to McKenzie Head. 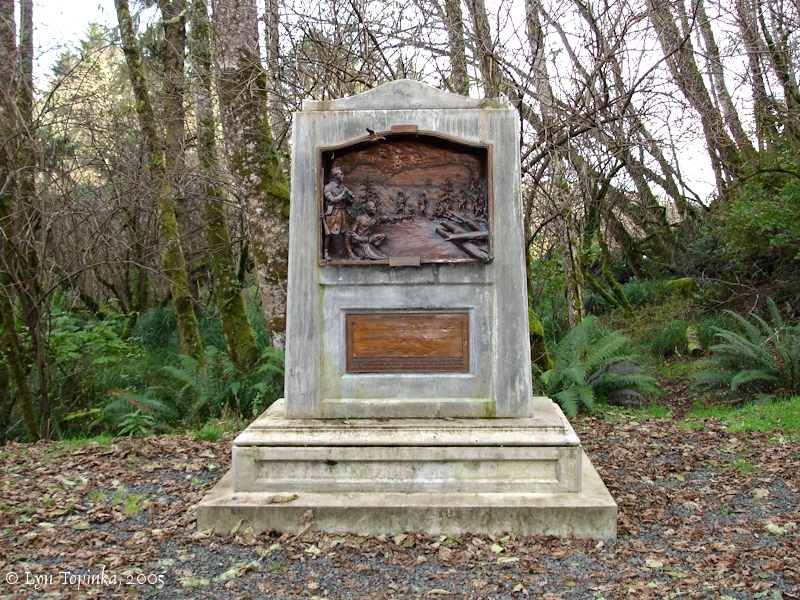 Also at the site, the Pacific County Friends of Lewis and Clark commissioned eight interpretive panels which are located at the summit of McKenzie Head, throughout the campsite and near North Head. Content includes the shifting shoreline, natural history, trail guides and events from the journals of the exploration dates in 1805. Click image to enlarge Captain Clark Monument, McKenzie Head, Cape Disappointment, Washington. Image taken November 9, 2005. 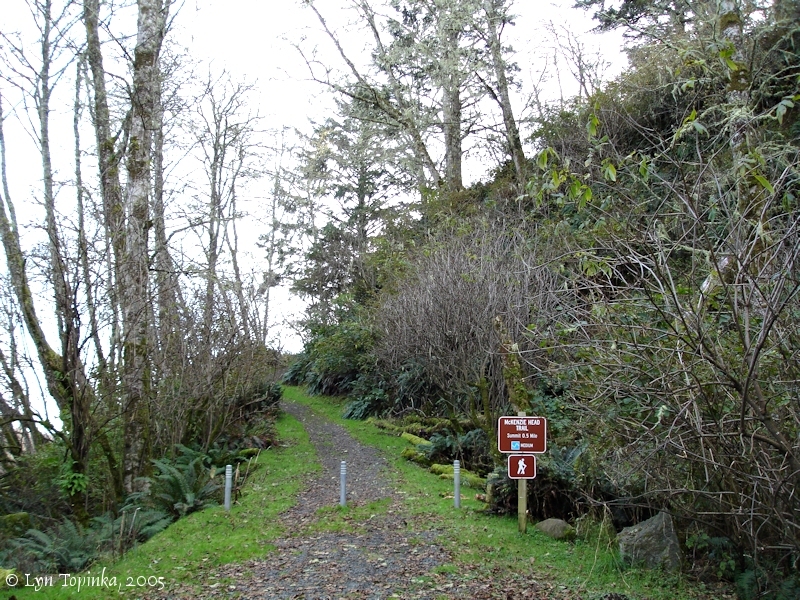 The trail to the top of McKenzie Head is 1/2 mile long and begins at a Lewis and Clark Trail marker. 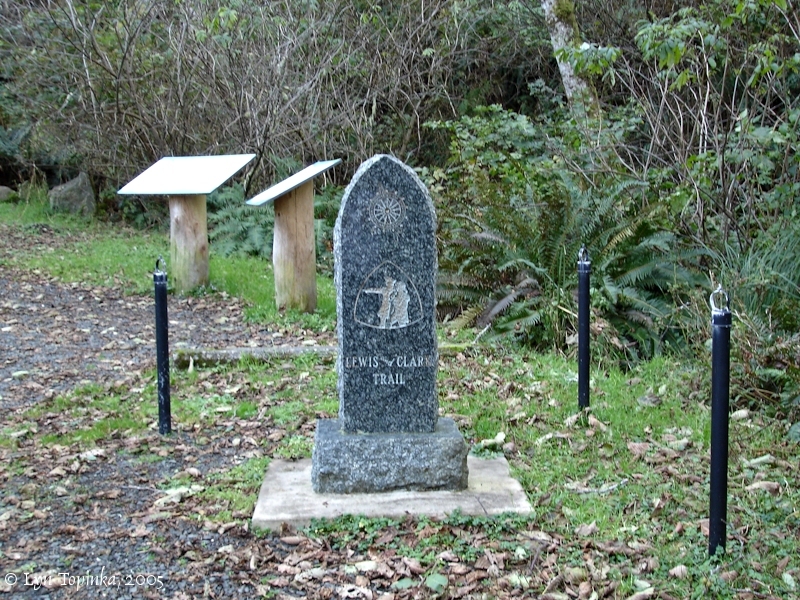 Click image to enlarge Lewis and Clark Trail Marker, McKenzie Head. Image taken November 9, 2005. 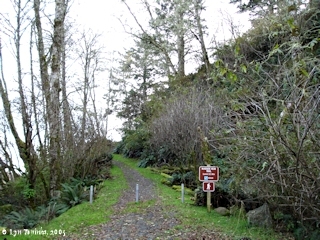 Click image to enlarge Base of Summit Trail, McKenzie Head. Image taken November 9, 2005.